The ocular oncology community is divided over when to treat small choroidal lesions: when they present with the risk of growth based on the TFSOM clinical standard or when they actually grow. The above graphic, (click on image for a larger size), uses everyday images to illustrate the size differences between a choroidal nevus (less than 5 mm) and small, medium and large-sized choroidal melanomas (5-18 mm). • A choroidal nevus is a lesion that is roughly the size of the end of a small birthday candle or less than 5 mm in diameter. • Small choroidal melanomas range in diameter from 5 – 10 mm, or from the eraser top of a pencil to the bottom of a AAA battery. • Medium choroidal melanomas range in diameter from 10 - 15 mm, or from a size slightly smaller than a watch battery to the bottom end of a tube of lip balm. • Large choroidal melanomas are more than 15 mm in diameter, or at least dime and penny-sized eye cancers. Eye cancers larger than 18 mm in diameter are usually enucleated (removed). First, the globe cannot tolerate the radiation doses required to successfully treat such a large cancer. Secondly, to prevent recurrences, treatment usually extends 2-3 mm beyond the tumor's edge. Since the COMS plaques range in size from 12 - 20 mm, a safety margin around a 19 mm tumor is not possible raising the risk of recurrence. 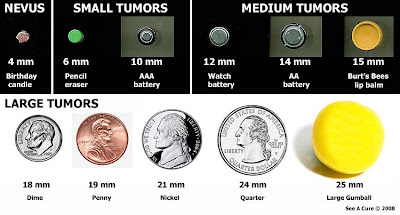 A 12 mm (watch battery-sized) tumor will be treated with at least a 14 mm (AA battery-sized) plaque. In contrast, small melanomas of 7 mm (pencil eraser-sized) in diameter will still be treated with the 12 mm plaque - the smallest currently available plaque size. Proton beam (pg. 19) is also a treatment option for choroidal melanomas. If you have been diagnosed with a small suspicious or a medium to large-sized choroidal melanoma, this graphic can put the size of your lesion/eye cancer into context using everyday examples which are easily found in a utility drawer or change purse. Cancer is a life-threatening disease in which early detection and treatment is the standard of care. Yet, the eye cancer community continues to debate the merits of early detection and treatment of small but suspicious choroidal nevi. Some ocular oncologists are diagnosing and treating extremely small lesions. Others advocate a wait-and-see approach in which growth indicates malignancy and therefore treatment. This conversation is taking place while 50% of the patient population dies at 10 to 15 years, a mortality rate that is unchanged despite treatment advances. Since the incidence rates in both the U.S. and Europe are also unchanged, it raises the question as to whether we are catching and treating this rare cancer in time to save the life of the patient. Under either the COMS or American Joint Committee on Cancer (AJCC) tumor classifications, small choroidal melanomas - when the threat to life is the lowest - are lesions that are less than 3 mm thick and at least 7 mm in diameter. The TFSOM clinical standard (click on above graphic to view larger image) found that the risk of malignant growth is 50% when 2 or more factors are present. Therefore, waiting for growth when malignant conditions already exist, is begging the question. Why does size matter? Genetic research is showing that uveal melanomas may acquire more chromosomal defects as they grow, leading to a higher risk of metastatic death. Currently, there is no treatment for metastatic uveal melanoma with the average time of diagnosis to death being 7 to 12 months in unresectable tumors. Without clear agreement and direction from the ocular oncology community, downstream providers, such as family practitioners, general ophthalmologists and optometrists, will fail to recognize these lesions as early cancers and refer out these patients for specialized sight and life-saving care. Since a ‘growth’ management philosophy may be potentially devastating on a patient’s outcome, See A Cure urges individuals presenting with small but suspicious choroidal lesions to be informed about the TFSOM standard and the diagnosing controversy so that they can either partner with their doctor - or obtain a second opinion - on their sight and life decision. Why do some small and unremarkable primary uveal melanomas metastasize while larger, more invasive eye tumors do not? What factors cause an existing choroidal nevus to transform into a choroidal melanoma? And how are those factors different from or similar to the ones that cause uveal melanomas to arise de novo (new)? How on earth is it possible that the rates of incidence (the number of people diagnosed) and mortality (number of people dying) for uveal melanoma remain eerily unchanged for decades despite diagnosing and treatment advances? Just what is uveal melanoma (also called choroidal melanoma, eye melanoma, ocular melanoma, intraocular melanoma, eye cancer and ciliary body melanoma)? More importantly, how do we successfully treat this rare and puzzling cancer? Uveal Melanoma: A Model for Exploring Fundamental Cancer Biology does not answer any of these questions. So far, much of the research on uveal melanoma chromosomes, molecules and proteins has only confirmed long-standing clinical observations that tumor pigmentation, diameter, blood vessel morphology, cell type, race, eye color influences its prevalence, progression and prognosis. In other words, all this cellular research has merely affirmed on a genetic level what was already known on a clinical level. Real progress will only be achieved when this genetic research is translated into improved patient outcomes - a process which appears decades away from reality. If, as one of the authors argues, that uveal melanoma is "an excellent model for the study of cancer biology in general," than a more multi-disciplinary and-faceted approach is warranted. That kind of support is not only going to come from the lab but also from the larger community of medical professionals and their patients. This was a fascinating book which ironically proves that research alone will not lead us to see a cure. This is an outstanding product and proof that medical information can be both accessible, informative and affordable. At this price, there's no reason this large 3-dimensional model isn't available for use by eye cancer (also called uveal melanoma, choroidal melanoma, eye melanoma, ocular melanoma, intraocular melanoma and ciliary body melanoma) patients and their ocular oncology or retinal specialist physician. The removable eye model is mounted on a sturdy platform allowing full rotation. The outside structure shows the eye muscles and a cut-away view of the three eye layers: the tough, outer layer of the white sclera, the blood-rich middle layer of the choroid and the inner retina, the half-moon area that covers the back of the eye. For brachytherapy patients, doctors can show their patients exactly where the disc-shaped plaques containing the radioactive seeds will be sewed onto the back of their sclera, what muscles will be cut to access the placement area and what vital structures, such as the optic nerve, could be impacted. Patients receiving proton beam, will see how the narrow beam will enter through the pupil to the target area. The model can also be used to explain other less common but available therapy such as trans-scleral resection or TTT. 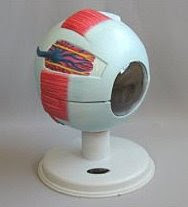 The horizontal halves of this model can then be separated for a look inside the eye. With this perspective, patients will appreciate the physical location of the tumor to vital internal structures such as the macula, fovea, major blood vessels, and the optic nerve, and compare that to the location of the external plaque delivering the tumor-killing radiation to the choroidal layer, where more than 85% of eye tumors arise. Depending on the tumor size, location and dose delivery, some radiation will seep past the choroid and negatively impact the retina causing a condition known as radiation retinopathy. The iris projects images onto the retina which sends those signals through the optic nerve to the brain for sight. Radiation retinopathy damages the smooth retinal surface, distorting and interrupting the visual process. Using this model, patients will see just how and why this happens. This model allows doctors to share with their patients vital insight into their care. And that's a perspective worth seeing. This fascinating little volume (only 121 pages), documents a symposium held to honor Dr. Willem Manschot, the 1979 recipient of the Snellen Medal, the Netherlands's award in ophthalmology. In 12 short papers, uveal melanoma researchers such as Oosterhuis, Zimmerman and McLean, Manschot and van Peperzeel, among others, discuss clinical versus histopathological diagnosis, tumor doubling times, natural history cases, treatment modalities (enucleation v. radiation), metastatic disease and mortality rates, proposing theories confirmed by the Collaborative Ocular Melanoma Study (COMS), more than 20 years later. What all these ocular oncologists have in common - despite their differences of opinion - are their incredible powers of observation and analysis and bold argumentation in challenging the assumptions about the causes of and treatment for uveal melanoma (also called choroidal melanoma, eye cancer, eye melanoma, ocular melanoma, intraocular melanoma or eye cancer). Zimmerman's radical thesis, later disproved, that enucleation caused dissemination of metastatic disease, nonetheless forced a change in the standard of care from enucleation to globe-sparing plaque therapy. Manschot's powerful argument about the risks of tumor doubling times on both primary and secondary disease progression, led to advocacy of earlier diagnosis of suspicious lesions and research toward chromosomes and prognostic molecular testing. These visionaries not only anticipated the COMS results, but also the revolution in molecular biology. That invaluable historical perspective keeps this 30-year old book relevant today. And their broad, well-read and multidisciplinary perspective has inspired current clinicians such as J.W. Harbour, C.L and J. Shields, Dan Albert, Hans Grossniklaus and Bruce Ksander among many others who will help us see the next revolution in uveal melanoma. Last night, representatives from See A Cure attended the 2008 Spring Symposium: Advanced Treatment of Melanoma Follow-up Guidelines by Disease Stage. The title artlessly but accurately summed up the evening’s theme. About 75 people attended the 3-hour event that was billed as “an evening of education, discussion and connection for patients, survivors, families and friends” and hosted by the Melanoma Foundation of New England (MFNE) on the Dana-Farber Cancer Institute campus. Skin cancer advocacy groups are well organized, vocal and can be a model to uveal melanoma advocacy efforts. And although cutaneous melanoma and uveal melanoma (an eye cancer also known as choroidal melanoma, eye melanoma, intraocular melanoma and ciliary body melanoma) are not the same disease, the diagnosing, staging, follow-up testing, research and clinical trials are similar for both patient populations. The most important overlap between skin and uveal melanoma patients is that there are few treatment options for metastatic disease. In fact, uveal patients receive treatment for metastatic disease that is designed for metastatic skin melanoma patients. Here’s a recap of the evening. Skin melanoma has ABCDE; uveal melanoma has TFSOM. Acronyms or mnemonics are effective ways to convey a complicated message. MFNE passed out wallet-sized guides to ID’ing skin cancer. A magnet would be a more visible tool. Skin cancer screening ad: "See Spot. See Spot Grow. See Dermatologist"; uveal needs eye-catching graphics, slogans and ads. Skin has the Ugly Duckling Theory which is to look for suspicious skin nevi within groupings of normal mole/lesions. There are visibility and asymptomatic challenges to “seeing” uveal melanoma. We need to brainstorm solutions. Tanning beds: Tanning bed UVA rays (vs. UVB) are deeply penetrating. Use of the beds may be cause of higher epidemiological rates (number of cases) and contributing to later development of deadlier disease. MFNE is organizing students to sign a "No Tanning Pledge." Uveal melanoma has no proven link to early sun exposure. However, there may be opportunities for 20-year olds + outreach through well-vision checks. Tanning Bed Bill – Public Act 1329, is in the Public Health Committee. MFNE is orgainizing outreach to legislators. Uveal can promote legislation on many issues which will be addressed in an upcoming article. Dr. Marie-France Demierren spoke on "Follow-up Guidelines for Non-Invasive Melanoma." In situ (contained) cancer is always better than invasive cancer. Skin cancer with vertical growth invades beyond the epidermis; uveal melanoma with vertical growth (tumors over 5mm high) break through the Bruch’s membrane with potential extraocular extension which allows both blood and lymph invasiveness. Skin melanoma uses the LDH serum blood test as a prognostic marker; so does uveal. Depending on grade (Stage I or IV), skin melanoma is treated by primary dermatologist and then a medical oncologist. Uveal patients are typically only seen by their ocular oncologist or retinal specialist. However, medium and large uveal melanoma patients should consider follow-up by a medical oncologist (see page 11) such as Dr. Hodi, Dr. Sato, Dr. Weber, Dr. Atkins among others. There’s info and then there’s actionable info according to symposium presenter, Dr. Michael Atkins. Early detection will lead to better treatment outcome is true for primary tumors but not metastatic ones; same rule applies to uveal which is why ocular oncologists differ on testing protocols. Mets disease can be detected 45-75% of the time through physical exam and history, imaging only 10% and blood tests 5% of the time. * Blood test have low sensitivity to disease until tumor burden already detectable through other means such as physical exam and feeling of lymph nodes; same is true in uveal. Europe is screening with the S100B – a sensitive blood test not routinely available in US and of no prognostic value in uveal. MIA (Melanoma Inhibitory Activity) and RT-PCR clinical tests that are not validated, yet; unclear benefit to uveal. * A normal scan does not mean no evidence of disease (NED); it means there is no measurable disease (if any). Treatment is based on measurable disease and mets may be present if not always measurable. * Adjuvant therapies (preventative care) are not given in either skin or uveal since no benefit shown when given for metastatic disease (same drugs used in adjuvant as in mets). * The median time to relapse is inversely related to disease stage of primary tumors for both skin and uveal melanoma (smaller tumors 6+ years; larger tumors, 2-3 years). Overall risk lessens over time for skin melanoma; is not true for uveal where threat of mets is lifelong due to long latency period. Chemotherapy: DTIC chemo been around 30 years. Works but not as long or as well as expected. Immunotherapy: IL-2 been around since 1998 (from data compiled between 1986-1994). No better than chemo. Combination: Both DTIC/IL-2 are effective but are toxic, inpatient, expensive and limited treatment locations (not avail at Dana-Farber). Response is better, relapse takes longer, but survival benefit is nominal. Molecular Targeted Therapy: CTLA-4 antibodies such as Ipilimumab and Tremelimumab fight tumor-induced immune suppression. C-kit by Dr. Hodi is a promising treatment. Challenge is that there are 20 or more subsets of skin melanomas that are molecularly different; uveal melanoma is fairly homogeneous suggesting single-agent treatment but research continues. Meantime, uveal mets patients receive skin melanoma therapies. Clinical trials: Debate over whether the treatment is better or the patient selection is better. Promising results from Phase I and II trials are not repeated in larger Phase III trials which suggests bias in patient selection in the smaller trials. Between 1975-2003 skin melanoma mortality rose 35% while prostate, breast, colon and cervical all dropped 50%, 10%, 25% and 10% respectively; uveal melanoma mortality remains unchanged for over 25 years despite treatment advances. Just 3-4 minutes of sun exposure are needed to get daily allowance of Vitamin D. Can get through supplements, too. SPF lotions must be applied 15-20 before sun exposure in order to provide maximum protection. MFNE did an excellent job providing information to the lay public - both patient and general interest - on skin melanoma issues. Their work can be a model for uveal melanoma organizational efforts. In “Tumors of the Eye and Ocular Adnexa,” ocular oncologist Dr. Devron Char, presents 27 well-organized chapters – moving from the external to internal eye - with references attached to each section. Numerous color and black-and-white photos and surgical drawings illustrate the test. This work fulfills three criteria for successful resources: To be affordable (the retail cost is $70), accessible (thanks to his layperson language), and accurate. What detracts from this work is the way medicine continues to organize cancer by location rather than pathology. This is no reflection on Dr. Char; his book (published in 2001 before the COMS results and the revolution in molecular biology) is one of 22 in the American Cancer Society’s Atlas of Clinical Oncology series that also features volumes on site specific themes such as prostate, lung, brain, bone, breast, among other cancers. As a result, skin cancers of the eye (cancers caused by UV radiation) such as lid and conjuctival tumors, are described in this book instead of ACS’s “Skin Cancer” volume. Retinoblastomas and neuroblastomas, childhood eye cancers, have cellular pathologies so radically distinct from any other eye neoplasm, that location alone doesn’t justify their inclusion here. And ocular melanoma, (also called choroidal melanoma, eye cancer, eye melanoma, uveal melanoma, intraocular melanoma or eye cancer), which continues to defy a standard diagnosis, treatment or cure (for 1 of every 2 patients), also belongs in a category all to itself. Someday, cancer professionals will think of cancer by its molecular biology rather than its physical location. But for now, Dr. Char’s birds-eye view of the eye cancer landscape is broadly revealing. Who Visits See A Cure? Each year, 2,000 adults are diagnosed with a sight and life-threatening eye cancer called uveal melanoma, a cancer that has no known cause and in which treatment is not a cure for 1 of every 2 patients. Welcome to the See A Cure Foundation, a grassroots organization founded by eye cancer patients and their families. The mission of our charitable and tax-deductible 501(c)(3)-pending group, is to fund research for and raise awareness of adult eye cancer. And to provide support to adult eye cancer patients and their families. 34. Metastatic Eye Cancer Drs. Links are intended as a resource and do not imply an endorsement of any therapy or institution. Unlike retinal specialists and general ophthalmologists, ocular oncologists are doctors specifically trained to treat cancer of the eye. This blog is for informational purposes only. You should not consider it medical advice or use it as a substitute for professional medical care. Remember: Get your eyes checked regularly by an ophthalmologist.